Ryanair has warned that more airlines will go bust over the coming 12 months due to higher fuel costs and the strengthening dollar. 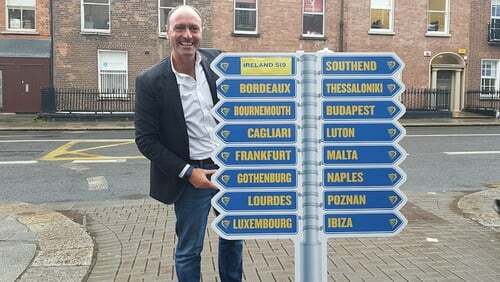 The airline's chief marketing officer, Kenny Jacob, issued the warning as Ryanair announced 15 new routes out of Dublin for its biggest ever Summer 2019 schedule. The airline has forecast that it will bring 16.4 million passengers in and out of Ireland next year, boosting the tourism sector by €2.3 billion. Asked about the pressures facing aviation in the coming period, Mr Jacobs noted that the dollar had appreciated by 10% since March, and that airlines buy fuel in dollars. In addition, the price of oil had more than doubled from $40 per barrel to $85 - but he stressed that Ryanair was protected by having hedged most of its fuel purchases. He acknowledged that Ryanair's union difficulties had been a big story for the last 12 months, but said the biggest story over the next 12 months would be rationalisation across the aviation industry driven by the price of fuel. He noted that two airlines - Primera and Small Planet - had gone bust in recent weeks and forecast that more collapses would follow, with additional consolidation and rationalisation in the industry. Mr Jacobs said Ryanair was now more optimistic that they would secure more agreements with unions across Europe in the coming months, as they had put a lot of things that unions were demanding on the table. However, he reiterated that Ryanair remains a low cost business, and that there are some "red lines" they will not cross. Asked what Ryanair would like the Government to do for aviation, he said it should keep doing what it is doing, and praised the decision to remove the travel tax in 2014. He also said the Government should focus on making it easy for airlines to grow and bring people to Ireland. Ryanair's new routes from Dublin next summer include services to Bordeaux, Bournemouth, Cagliari, Frankfurt, Gothenburg, Lourdes, Luxembourg, London Southend and Thessaloniki. Ryanair also announced five new routes from Cork - Budapest, London Luton, Malta, Naples and Poznan, while a new route from Shannon to Ibiza will also start next summer. Ryanair said the new routes will deliver 16.4 million customers through the Irish airports, as its Irish passenger numbers grow by 3%. Dublin Airport Managing Director, Vincent Harrison, said that Ryanair is an important customer for the airport. "The addition of these new services means that Ryanair is now connected to more than 100 destinations from Dublin Airport, offering more choice and flexibility for customers," Mr Harrison said. The CEO of Tourism Ireland, Niall Gibbons, said that the agency already works very closely with Ryanair. "We look forward to co-operating with them to maximise the promotion of their services to Dublin, Cork, Kerry, Knock and Shannon Airports next year," he said. "As an island, the importance of convenient, direct, non-stop flights cannot be overstated - they are absolutely critical to achieving growth in inbound tourism," he added. Mr Gibbons also said that 2018 looks set to be another record year for Irish tourism, with the latest CSO figures showing more than 7.2 million arrivals from overseas during January to August this year - an increase of almost 8% when compared to the same eight-month period in 2017. European pilot unions have accused Ryanair of engaging in a "declaration of war" to crew by closing bases in Germany and the Netherlands from November 5. The claim comes in a statement issued by the the European Cockpit Association, the umbrella group for pilot unions representing 38,000 pilots across Europe. Ryanair has already confirmed that it will be closing its bases in Bremen and Eindhoven, as well as downsizing its base in Niederrhein, Germany. The ECA said the Ryanair base closures and fleet reduction were perceived as a punishment for the lawful industrial actions by pilots and cabin crew, and that such a hostile, confrontational and counter-productive approach would not be tolerated. ECA President Dirk Polloczek said no-one should be surprised if Ryanair pilots were to insist on industrial action including strikes in affected countries, which could spill over to other European countries. He said the "aggressive" move by Ryanair management came on top of already tense relations with its employees, and stalled negotiation in numerous countries. He demanded the immediate reversal of the Eindhoven and Bremen base closures, and of the proposed downsizing of the base at Niederrhein. He said it was hard to see how Ryanair could realistically expect to reach agreements with its unions - which the airline hopes to do by Christmas - with such unhelpful "threats" hanging in the air. The President of the German pilots union VC, Martin Locher, said closing a base and forcing staff to relocate or lose their job and income would not build trust or a solid basis for constructive negotiations - and was incompatible with social dialogue. He said the announcement of the base closures from November 5 would be a milestone to test management's real intentions. The President of the Dutch pilots' union VNV, Arthur van den Hudding, warned that if Ryanair management thought that closing bases was a quick and cheap fix for the employee unrest, there were "naïve at best and antagonistic at worst". He said instilling fear among Ryanair workers and de-facto restricting their right to strike would never be tolerated.